The Friday Five | hi Sugarplum! The re-entry back to real life has been shaky this week, so thank goodness for Friday! I’m still playing catch-up from being gone, we’re hosting our son’s birthday party, and the kid’s first day of school is Monday…so the weekend is likely to be crazed. Here’s my random Friday Five for your entertainment. 1) Clearly I can’t get enough of black and white stripes, since this is the third week in a row I’ve used them in an outfit board. But can you blame me?! They are so classic, yet perfectly graphic for virtually any outfit. This striped cotton knit blazer is soft and light-weight, and adds polish, while helping to transition your Summer outfits to Fall. And I love the cute feminine-gathers in the back! The maxi, according to the 322 reviews, is near perfect. Both pieces are on crazy-sale, and inspired me to create this entire outfit using only sale items. 2) I’m always a sucker for cute printables, especially free ones. Leo + Lamb is a gorgeous site that allows you to easily and quickly personalize stationary, invitations and party decor, then download and print yourself. 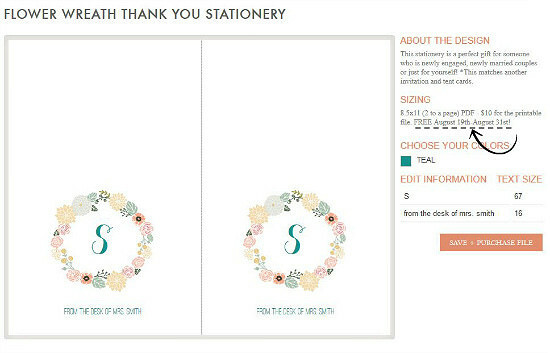 Their lovely flower wreath stationary is currently available for free download, so I jumped at the chance to personalize it for my daughter’s new teacher. Tied with a satin ribbon, they will make a pretty back-to-school gift to start the year off right! 3) Kid’s rooms are always my favorite to create and see, and I’m smitten over Jennifer at Dimples and Tangles teen son’s rustic, yet still modern, room. Jen’s always cranking out the greatness…like these fur ottomans, and I’m always drooling over her perfect vignettes and styling. 4) I’ve been working really hard behind-the-scenes on my first Joss & Main Curator Sale and can’t wait to share it with you soon! Mark your calendars…my sale goes live Tuesday, September 2! If I didn’t know better, I’d almost think I was a legit blogger. 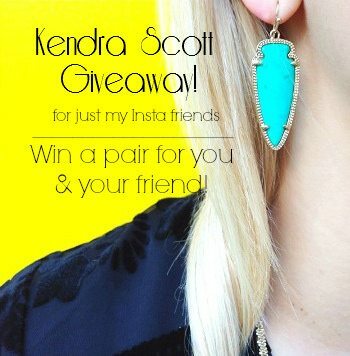 5) Kendra Scott gifted me with two pair of the arrowhead-style ‘Sky’ earrings, and I decided to pass them along to you guys! You are always so encouraging and supportive, so I thought it’d be fun to give them away on InstaGram, my favorite social media. Simply go to this InstaGram post, tag your best friend, and follow @cassiesugarplum. That’s it! Feel free to enter as many times as you want, just be sure to tag a different friend each time. I’ll pick the random winner Sunday night, and send you and your BFF your colors of choice! What color earrings would you choose? Are you hooked on InstaGram like me?! I’m off to snag that striped blazer before it sells out….happy weekend, lovebugs! I am going to have to check out Jennifer's blog. Her son's room looks amazing!!!! Hope you have a wonderful weekend! 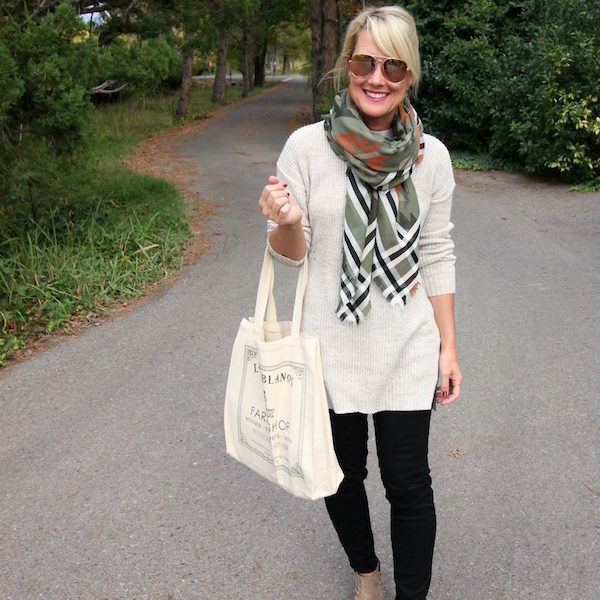 Everything on Jennifer's blog is fabulous…you'll get lost for hours over there! Happy weekend to you, friend! 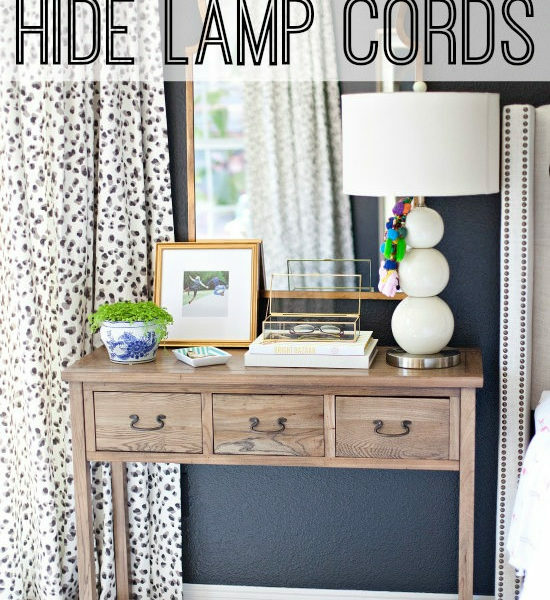 Loved the teenager's room and those wonderful sconces. Really liked the striped jacket. How about a Friday five doing that jacket five different ways? I know you can do it! Yay! 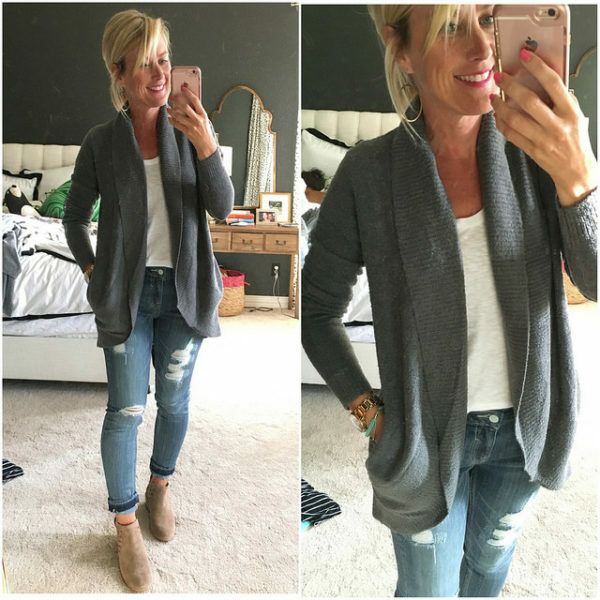 I couldn't resist & just ordered the jacket & would love to see some different ways to wear! I'm looking forward to it… you are a stripes girl! Just got an email from Nordstrom saying they could not fulfill my order – sold out 🙁 I'm so bummed! Boo!!!! Get on the wait list tho, they are good about letting you know when it's back in stock! yes – totally hooked and luv them earrings (as u might see from my tags, lol!) and you're killing me with the entry way make over – cant wait to see what you did for the function details. 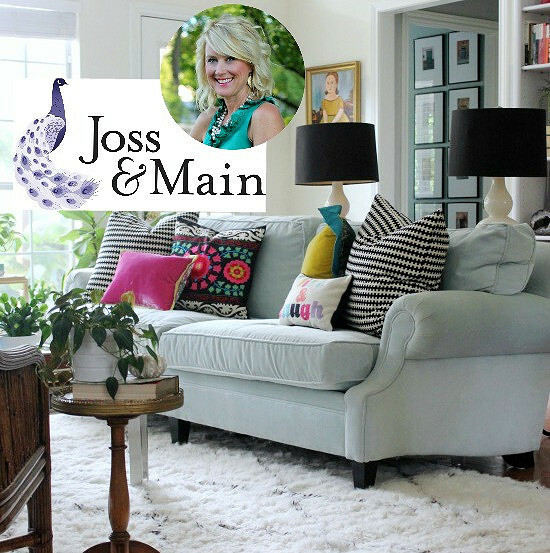 Yay for Joss & Main! Love the freebie from Leo+Lamb! Thanks for the tip!!! Yipeeeeeeeeeeee for Joss and Main!! I am so excited for you!!!! SO exciting about the J&M collab! Woo hoo! 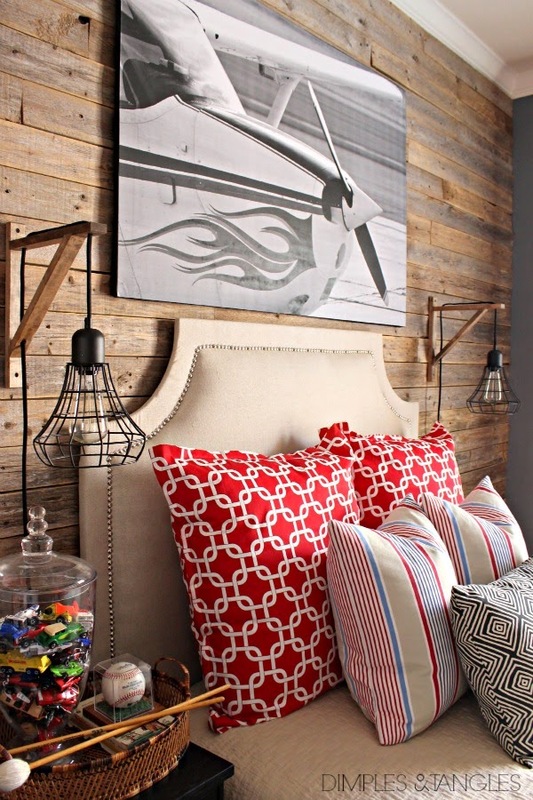 And I am going over to check out that boys room…love all the inspo I can get!! YOU'RE CURATING A JOSS & MAIN SALE???? How exciting! I can't wait to see what you choose! Thank you SO much for featuring Caleb's room and your sweet compliments. High praise coming from your stylish self! Have a great weekend, Cassie. Sounds like it will be a busy one! Your vacation looked fabulous Cassie! It was fun seeing tidbits on IG. Cute striped jacket and I think I need to get that black maxi. The more I see it the more I want it. Congratulations on Joss & Main!! Can't wait to see. That is so exciting! Have a great weekend. Always love your Friday posts! 🙂 Your vacation pics were amazing and inspired me to plan a trip next summer. I cannot wait to hear the details. Congrats on your Joss and Main collection! Can't wait to check it out! I love the KS earrings, especially the blue, or maybe the pink! Love the jacket! What size did you order? Hi Mego….I ordered the XS, but only bc the small was sold out at the time. Fingers crossed it fits…since it's kind of a knit material, I think it will have some give. Um dude! Why didn't you tell me you were doing a Joss event!?! It would have given me more time to build my bank account! Sigh… congrats girl!! Hi friends, and Happy Friday! We’ve got a crazy weekend full of sports, birthday parties and an egg hunt, but hopefully I can squeeze in a little project time. And Mexican food the laundry. 1) I’m not sure when I’ll be able to show you the full reveal of the Home Depot Patio Challenge, but my deadline to complete it is next Friday…so I’d better get busy! Here’s a little sneaky peeky of the space with the fab set they sent me! Thanks to my son, we got it assembled pretty quickly. You’ve seen the rug and dry-erase serving tray, but I’ve got one more project planned before putting it all together. 2) I had a great idea for an Easter tablescape centerpiece, involving a bowl of thick, green grass. But 10 days after planting the ‘guaranteed to grow anywhere fast’ grass, this is what we’re looking at. It’s a good thing my sister-in-law just decided to host Easter brunch this year. 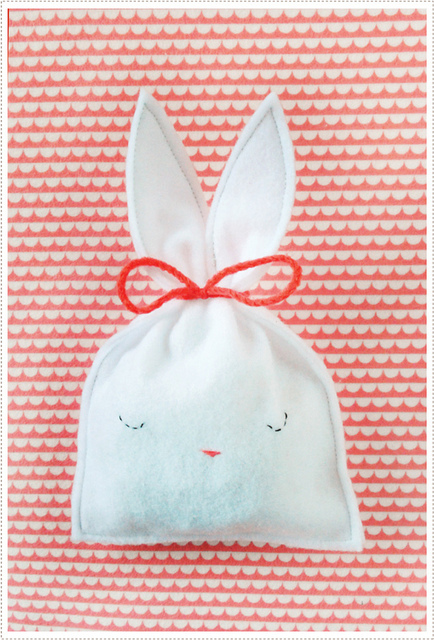 3) And speaking of Easter, I intended to make MerMag’s adorable Easter Bunny Pouch as a treat for my kid’s teachers. But Babygirl’s birthday happens to fall on Easter Sunday this year, so we’ve been busy with party planning instead. But can you stand this bunny cuteness? Maybe I’ll find a way to whip out one or two. 4) The cute and sassy Caycee posted this stripey goodness on her InstaGram last week, and I knew it had to be mine. Thank goodness for smartphones, because I ordered it from somewhere in the middle of nowhere. I can never resist stripes, so this skirt and dress are on the way, too. And I’ve got my eye on this one from Old Navy (use ONSAVE25 for 25% off your total order thru Sunday!). I pretty much want everything in this Destination: Vacation round up from Forever 21! Someone cut me off! 5) Did you see the Living Room Emily Henderson just designed, and revealed on her blog? I, of course, loved every detail of the colorful and quirky room…but then felt elated when I realized I have similar elements in my Living Room (still unfinished, fyi). I’m not a designer and have zero training…I just put things together that I like and make me happy, and hope for the best. It’s reassuring to see a legit designer, who’s work I adore, use similar elements and pairings. Seeing this fabulous room, with the blue sofa and striped throw, brass cuffs on table legs, gold tables, oversized Fiddle Leaf, and funky upholstery, lets me know I’m on the right track. I suppose you could call it validation. But really, it’s just confidence to keep going and create what I love. Oh, and the random winner of the Monogrammed Clutch was announced here. I hope it was you! What’s on your Friday Five today? Are you busy not growing grass and not making Easter treats? Happy weekend, lovebugs! love it all, but especially my girl Caycee and her adorable self in that dress! Looks like your baby girl and my hubby share the same birthday! The patio is looking awesome! i can't open any of the links from the things you bought! 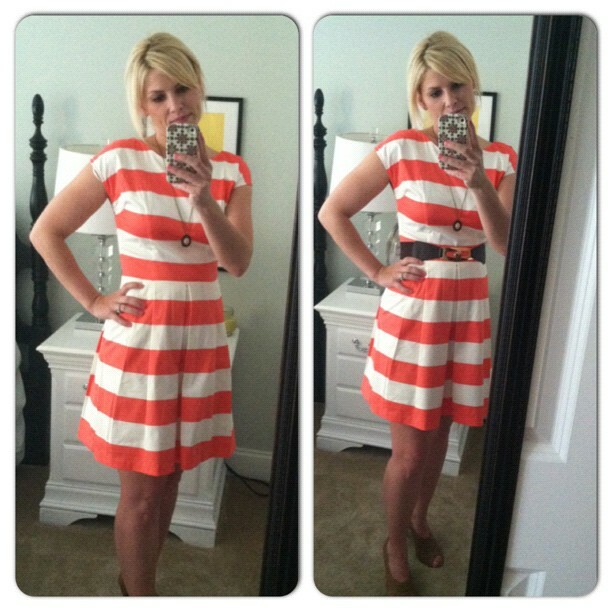 wish i could because i love that striped dress (but the old navy links work for some reason?)! love your striped dress and can't wait to see the patio when you're done! Busy weekend for sure! Can't wait to see the patio reveal! And Caycee couldn't be cuter in that dress. Off to check it out this weekend. Fun round up! You should check out the jersey striped from from ON as well. I have it in a solid and its the most comfortable, twirliest dress you've ever seen. And only $15!! 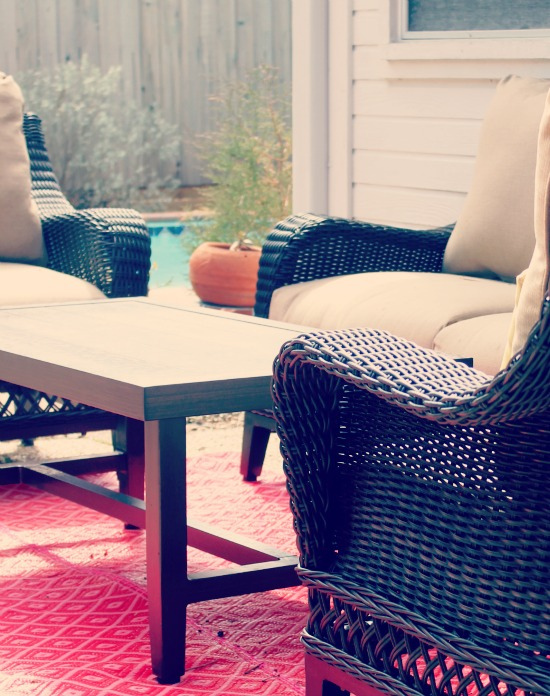 Ooh your patio project is looking great! I can't wait to see the big reveal! Have a great weekend, Miss Cassie! 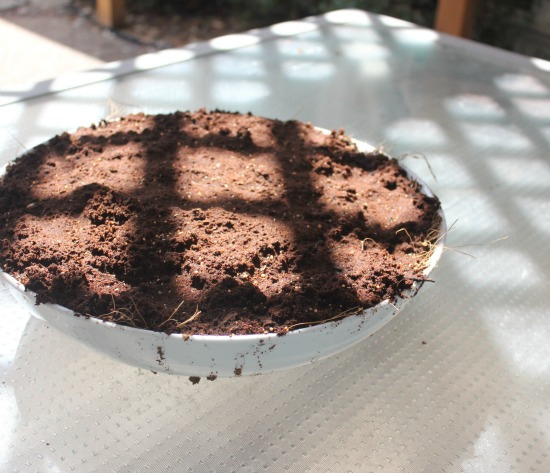 Try planting wheat germ grass. I get the wheat germ from the bulk bins at the natural food store. Soak them overnight, sprinkle on damp soil, and cover container w/ plastic wrap until they sprout. Usually only takes a few days to have lush grass! I usually kill any plan I touch! I am crossing my fingers this year! Wheres the kiss button? Cause I like to give you a big one!!! Thanks girl ;). Plus can not wait to see the patio…I know its going to be amazing!!! Thanks for the clothes ideas cause I totally got that dress this morning! Is it short? That's always my fear with F21 stuff. Can't wait for the patio reveal! Cant wait to see your patio reveal! I am so ready for spring and itching to see the colorful space. Don't worry about not growing grass… We currently have a dirt yard because our seed never took last fall. I can't wait to see your finished patio! I'm sure it's going to look amazing! And that dress is absolutely adorable! I want one! I love that dress!!! I've never ordered anything from F21 before. What size did you order? Hey, hey, hey!! We made it to the end of another week, and a whole glorious weekend lies ahead, so let’s get to it with The Friday Five! 1) It’s no secret I have a girl-crush on Lauren from Aspiring Kennedy. I am so jealous of her ex-pat life, and love reading about her travels and adventures. And thanks to her Apartment Therapy House Tour this week, now I can picture her life in the adorable Notting Hill flat she shares with her cute hubby. I mean really, a flat in Notting Hill? Could life be any sweeter?! 2) I’ve touched on this topic before, with my Letter from the Editor, but if you blog long enough, eventually financial opportunities will come your way. It’s a delicate line to walk between creativity and entrepreneurship. (Wow, that may well be the biggest word ever used on Hi Sugarplum!, and thank goodness spell-check knew what I was trying to say!) But as many of you comment on, it does take a lot of work, time, and money to crank out five posts a week, chock-full of projects and ideas. Erin really explained it well in her Business of Blogging post. I love every aspect of blogging, and you can trust that my voice and opinions are, and will remain, 100% my own. 3) My aunt recently discovered Askanam on Etsy, an adorable custom cookie shop. Or should I say shoppe? 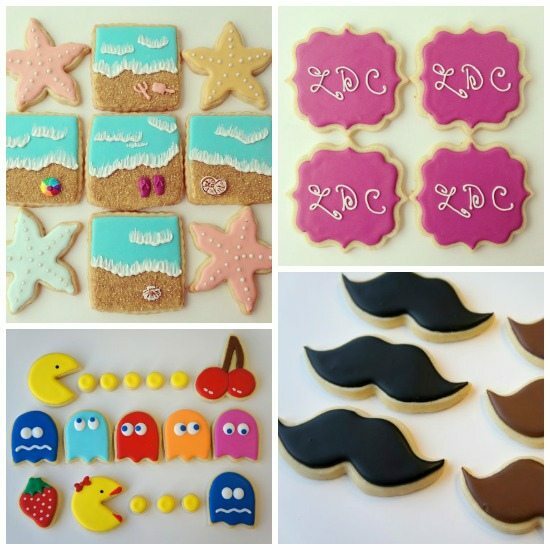 Her natural and organic cookies are pure art…makes me want to throw a party just so I can use those mustaches! 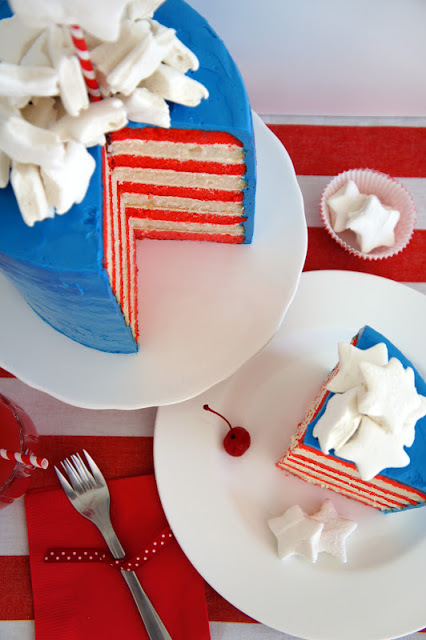 She has a blog, too, where she shares amazing ideas like this Fourth of July cake. Kind of puts my Rainbow Cake to shame! 4) This image from C. Wonder (the affordable brainchild of Tory Burch’s ex-hubby), has me excited for Spring! I need one of each, please, Fairy Godmother! 5) And finally, speaking of Spring….Home Depot asked me to participate in their Blogger Style Challenge: Patio Edition….and if you could see my patio right now, you’d know what a real challenge this will be! Hopefully we get some Spring temperatures this weekend so Mr. Sugarplum we can begin the clean-up. Here’s a peek from last year’s challenge….just so you know the uphill battle we’re facing! Wow, a lot of ramblings today. What’s rattling around in your head? Is your backyard a dead tumbleweed, too? What are your thoughts about bloggers making money? Happy weekend, lovebugs! Thanks for the heads up on C. Wonder and congrats on the Home Depot challenge. I can't wait to see what you do! YAY Friday Five! I cannot wait to read the blogging post. I'm new to this whole thing, and hoping to learn more! Totally in love with that pink and yellow palette…I need more flamingos in my life! I just get jealous when I see all the amazing desserts that people are able to create…thank goodness they sell them, right? (c; Good luck on the Home Depot challenge, we all know you're going to rock their socks off! Those cooks are adorable!!! Thanks for sharing the Etsy link. Thank you so much for featuring my cookies on your wonderful blog, I am honored! Can't wait to read more of your interesting blog spots, I am glad to have discovered it through your sweet aunt. And good luck with the Home Depot Challenge!!! Can't wait to see your patio. Mine needs some attention as well. Just planted some flowers this week myself. That 4th of July is amazing! I thought your rainbow cake was pretty fabulous, too. I need to step up my cakes. Good luck and have fun with your Home Depot challenge! garsh I would love to make money on my blog.. but I don't think I'm quite there yet.. but I think it's totally cool that bloggers make money on their blog! If anyone says differently I would wonder why.. I am dying for spring to get here. So rainy and gloomy in Atlanta.. can't wait to see your patio! Thanks for the Friday Five! I have faithfully read you blog for sometime now and especially enjoyed today. Don't get me wrong I like everything you share but, it's great when a blogger points out other things of interest. So, thank you! Mustache cookies…seriously too awesome! I am also wishing I had an occasion to need those. Great post! I appreciate how you handle your money making opportunities. I know you get a lot of offers. Some bloggers do one almost every time they post and it turns me off. Original content that isn't sponsored every time is what attracted people to blogs. I enjoy hearing who sponsors your blog. Where you have guest posted, and the giveaways because they all highlight something I would've never seen without reading blogs. I think it is cool that you can get paid for something you enjoy doing. I would so try, but I don't think I am cut for a blogging lifestyle.